Abu-Lughod, J. (1989). Before European Hegemony: The World System A.D. 1250-1350. Oxford University Press, New York. ———. (1991). Going Beyond the Global Babble. Culture, Globalization and the World System, King, A. (Ed. ), Macmillan, London. ———. (2001). New York, Chicago, Los Angeles: America's Global Cities. University of Minnesota Press, Minneapolis. Agnew, J.A. (1996). The territorial trap: the geographical assumptions of international relations. Review of International Political Economy, 1(1):53-80. ———. (2002). Place and Politics in Modern Italy. The University of Chicago Press, London. Arrighi, G. (1994). The Long Twentieth Century: Money, Power and the Origins of our Times. Verso, London. Beaverstock, J.V., Taylor, P.J. and Smith, R.G. (1999). A Roster of World Cities. Cities, 16(6):445- 458. Beck, U. (2000). What is Globalization? Polity Press, Cambridge. Braudel, F. (1986). Civilization and Capitalism (15th-18th Century. The Perspective of World. Vol.III, Harper and Row, New York. Brenner, N. (1997a). Global, fragmented, hierarchical: Henri Lefebvre's geographies of globalization. Public Culture, 10(1):135-167. ———. (1997b). State territorial restructuring and the production of spatial scale: urban and regional planning in the FRG, 1960-1990. Political Geography, 16(4):273-306. ———. (1998a). Global cities, glocal states: global city formation and state territorial restructuring in contemporary Europe. Review of International Political Economy, 5(1):1-37. ———. (1998b). Globalization as Reterritorialization: The re-scaling of urban governance in the European Union. Urban Studies, 36(3):431-451. Bunnel, T., Barter, P. A. and Morshidi, S. (2002). Kuala lumpur metropolitan area. Cities, 19(5):357-370. Buroway, M., Blum, J., George, S., Gille, Z., Gowan, T., Haney, L., Klawiter, M., Lopez, S., Ó Riain, S. and Thayer, M. (2000). Global Ethnography: Forces, Connections and Imaginations in a Postmodern World. University of California Press, Berkeley. Castells, M. (1989). The Informational City. Blackwell, Mass, Cambridge. ———. (1997). The Information Age. Blackwell, Oxford, UK. Cox, K.R. (2001). Territoriality, politics and the 'urban'. Political Geography, 20:745-762. Curtin, P. (1984). Cross-Cultural Trade in World History. Cambridge University Press, Cambridge. Davis, D. (2003). Cities and Globalization: Old Wine in New Bottles? http://www.commurb.org/features/globalizaiton.html (accessed on 10/23/2003). Dittmer, L. (2002). Globalization and the Twilight of Asian Exceptionalism. Globalization and Democratization in Asia, Kinnvall, C. and Jonsson, K (Eds. ), Routledge, New York. Douglass, M. (2000). The Rise and fall of world cities in the changing space-economy of globalization: comment on peter j. taylor's "world cities and territorial states under conditions of contemporary globalization". Political Geography, 19:43-49. Dunford, M., and G. Kafkalas. (1992). The Global-Local Interplay, Corporate Geographies and Spatial Develeopment Strategies in Europe. Cities and Regions in New Europe, Dunford, M. and Kafkalas, G. (Eds. ), Belhaven Press, London. Featherstone, M. (1995). Undoing Culture: Globalization, Postmodernism and Identity. Sage, London. Frank, A.G. (1998). Re-orient: Global Economy in the Asian Age. University of California Press, Berkeley. Friedmann, J. (1995a ). The World City Hypothesis. World Cities in a World System, Taylor, P.J. (Ed. ), Cambridge University Press, Cambridge (Original edition, Development and Change, 17(1):69-83). ———. (1995b). Where We Stand: A Decade of World City Research. World Cities in a World System, P. J. Taylor (Ed. ), Cambridge University Press, Cambridge. Friedmann, J. and G. Wolff. (1982). World city formation: an agenda for research and action. International Journal of Urban and Regional Research, 6(3):309-44. Geddes, P. (1915). Cities in Evolution. Oxforf University Press, London. Gille, Z. (2001). Critical ethnography in the time of globalization: toward a new concept of site. Cultural Studies, Critical Methodologies, 1(3):319-334. Gille, Z., and B. O'Riain. (2002). Global ethnography. Annual Review of Sociology, 28:271-95. Giordona, B. (2001). The contrasting geographies of 'padania': the case of Lega Nord in Northern Italy. Area, 33(1):27-37. Gupta, A. and Ferguson., J. (1997). Beyond Culture: Space, Identity and Politics of Difference. Culture, Power, Place, Gupta, A. and Ferguson, J. (Eds. ), Duke University Press, London. Hall, P. (1966). The World Cities. Weidenfeld and Nicholson, London. Hall, T. and P. Hubbard. (1996). The entrepreneurial city: new politics, new urban geographies? Progress in Human Geography, 20(2):401-424. Hall, T. and Hubbard, P. (1998). The Entreprenurial City. Wiley, Chichester. Held, D. and McGrew, A. (1999). Global Transformations: Politics, Economics and Culture. Stanford University Press, Stanford. Hill, R. C., and Kim, J.W. (2000). Global cities and developmental states: New York, Tokyo and Seoul. Urban Studies, 37(12):2167-2195. ———. (2001). Reply to Friedmann and Sassen. Urban Studies, 38(13):2541-2542. Holston, J. (2001). Urban Citizenship and Globalization. Global City-Regions, Scott, A.J. (Ed. ), Oxford University Press, Oxford. Işın, E.F. (2000). Democracy, Citizenship and the City. Democracy, Citizenship and the Global City, Işın, E. (Ed. ), Routledge, London. Jessop, B. (1997). The Entrepreneurial City. Transforming Cities: Contested Governance and New Spatial Divisions, Jewson, N. and MacGregor, S. (Eds. ), Routledge, London and New York. Jessop, B. and Sum, N. (2000). An entrepreneurial city in action: Hong Kong's emerging strategies in and for (inter) urban competition. Urban Studies, 37(12):2290-315. Keyder, Ç. (1981). The Definition of a Peripheral Economy: Turkey 1923-1929. Cambridge University Press Cambridge. ———. (1992). İstanbul'u nasıl satmalı? Istanbul, (3):81-85. Keyder, Ç. and A. Öncü. 1993. İstanbul yol ayrımında. Istanbul, 7:28-35. ———. (1993). Istanbul and the Concept of World Cities. Friedrich Ebert Foundation, Istanbul. Kearney, M. (1995). The local and the global: the anthropology of globalization and transnationalism. Annual Review of Anthropology, 24:547-65. Keil, R. (1998). Los Angeles: Globalization, Urbanization and Social Struggles. John Wiley and Sons, New York. King, A. (1989). Urbanism, Colonialism, and the World Economy: Cultural and Spatial Foundations of the World Urban System. Routledge, London. ———. (1990). Global Cities: Post Imperialism and the Internationalization of London. Routledge and Kegan Paul, London. ———. (2000). Postcolonialism, Representation, and the City. A Companion to the City, Bridge, G. and Watson, S. (Eds. ), Blackwell, Oxford. Komili, H. (1996). Turkiye'nin Geleceği ve Istanbul. Gorus(Kasım):6-7. Lash, S. and J. Urry. (1994). Economies of Signs and Space. Sage, London. Lipietz, A. (1993). The local and the global: regional individuality or interregionalism? Transactions of the Institute of British Geographers, 18:8-18. Machimura, T. (1992). The urban restructuring process in Tokyo in the 1980s: Transforming Tokyo into a world city. International Journal of Urban and Regional Research, 16(1):114-128. ———. (1998). Symbolic use of globalization in urban politics in Tokyo. International Journal of Urban and Regional Research, 22(2):185-94. Mann, M. (1997). Has globalization ended the rise and rise of the nation-state? Review of International Political Economy, 4(3):472-496. Massey, D. (1994). Space, Place and Gender. University of Minnesota, Minneapolis. Massey, D. and Jess, P. (2000). Introduction. A Place in the World? Places, Cultures and Globalization, Massey, D. and Jess, P. (Eds.). The Open University and Oxford University, Oxford. McMichael, P. (2000). Development and Social Change: A Global Perspective. Pine Forge Press, Thousand Oaks, Calif.
Molina, A. (2000). A Global Cities Dialogue. Telecities Network and Stockholm Challenge Award, Stockholm. Mollenkopf, J. and Castells, M. (1991). The Dual City. Russel Sage, New York. Olds, K. (2001). Globalization and Urban Change. Oxford University Press, Oxford. Panitch, L. (1994). Globalization and the State. Socialist Register 1994, Miliband, R and Merlin, P. (Eds. ), Press, London. Passi, A. (2002). Bounded spaces in the mobile world: deconstructing regional identity. Tijdschrift voor Economische en Sociale Geographie, 93(2):137-148. Robertson, R. and Khondker, H.H. (1998). Discourses of globalization: preliminary consideration. International Sociology, 13(1):25-40. Sassen, S. (1991). The Global City: New York, London, Tokyo. Princeton University Press, Princeton. ———. (2000). Spatialities and Temporalities of the Global: Elements for a Theorization. Public Culture, 12(1):215. ———. (2001a). Global City. 2nd edn., Princeton University Press, Princeton. Sassen-Koob, S. (1984). Capital Mobility and Labor Migration: Their Expression in Core Cities. Urbanization in the World System, Timberlake, M. (Ed. ), Academic Press, New York. ———. (1986). New York city: economic restructuring and immigration. Development and Change 17(1):85-119. Scott, A. J. (1998). Regions and the World Economy. Oxford University Press, Oxford. Shachar, A. (1995). World Cities in the Making: The European Context. North American Cities and the Global Economy: Challenges and Opportunities, Kresl, P. and Gappert, G. (Eds. ), Thousand Oaks, Sage. Shaw, M. (1997). The state of globalization: towards a theory of state transformation. Review of International Political Economy, 4(3):497-513. Short, J.R., Kim, Y., Kuus, M. and Wells, M. (1996). The dirty little secret of world cities research- data problems in comparative analysis. International Journal of Urban and Regional Research, 20(4):697-719. Smith, D.A., Solinger, D. and Topik, S. (1999). States and Sovereignty in the Global Economy. Routledge, New York. Smith, D. A., and M. Timberlake. (1995). Conceptualizing and mapping the structure of the world system’s city system. Urban Studies, (32):287-302. Smith, N. (1988). Geography, Difference and the Politics of Scale. Postmodernism and Social Sciences, Doherty, J., Graham, E. and Malek, M. (Eds. ), St. Martin's Press, New York. ———. (1999). Which New Urbanism? New York City and the Revanchist 1990s. The Urban Moment: Cosmopolitan Essays on the Late-20th-Century City, Beauregar, R. and Body- Gendrot, S. (Eds. ), Thousand Oaks, Sage. Smith, M.P. (1999). Transnationalism and the City. The Urban Moment, Beauregar, R. and Body- Gendrot, S. (Eds. ), London, Sage. Soja, E.W. (1989). Economic Restructuring and Internationalization of the Los Angeles. The Capitalist City, edited by M.P. Smith. Blackwell, Mass, Cambridge. Storper, M. (1997). The Regional World: Territorial Development in a Global Economy. The Guilford Press, New York. Swyngedouw, E. (1997). Excluding the Other: The Production of Scale and Scaled Politics. Geographies of Economies, Lee, R. and Will, J (Eds. ), Arnold, London. Taylor, P.J. (1995). World Cities and Territorial States: The Rise and Fall of Their Mutuality. World Cities in a World-System, Knox, P.L. and Taylor, P. (Eds. ), Cambridge University Press. Cambridge. ———. (1996). Embedded statism and the social sciences: opening up to new spaces. Environment and Planning A, 28(11):1917-928. Tekeli, I. (1982). Türkiye'de Kentleşme Yazıları. Turhan Kitabevi, Ankara. ———. (1992). Dünya Kenti İstanbul. Gorus (Kasim-Aralik). Tim, H. and Hubbard, B. (1996). The entrepreneurial city: new politics, new urban geographies. Progress in Human Geography, 20(2):153-74. Todd, G. (1995). "Going Global" in the Semi-periphery: World Cities as Political Projects. World Cities in a World System, Knox, P.L and Taylor, P.J., Cambridge University Press, Cambridge. Toulouse, C. (1991). Thatcherism, class politics, and urban development in London. Critical Sociology, 18(1):55-76. Van Houten, P. (2003). Globalization and Demands for Regional Autonomy in Europe. Governance in a Gobal Economy: Political Authority in Transition, Kahler, M.A and Lake, D. Princeton University Press, Princeton, NJ. Wallerstein, I. (1996). Open the Social Sciences: Report of the Gulbenkian Commission on the Restructuring of the Social Sciences. Stanford University Press, Stanford, Calif.
Wu, F. (2000). The global and local dimensions of place-making: remaking shangai as a world city. Urban Studies, 37(8):1359-1377. Yeung, Y., and F. Lo. (1998). Globalization and the World City Formation in Pacific Asia. In Globalization and the World of Large Cities, Lo, F.-C. and Yeung, Y.-M. (Eds. ), United Nations University Press. Tokyo. Yusuf, S. and Wu, W. (2002). Pathways to a world city: shanghai rising in an era of globalisation. Urban Studies, 39(7):1213-1240. ISNAD Geniş, Şerife . "Globalization of Cities: Towards Conceptualizing a New Politics of Place-Making in a Transnational Era". 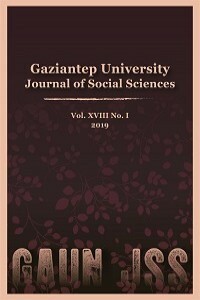 Gaziantep University Journal of Social Sciences 6 / 1 (June 2007): 59-77.